On 22 September 1939 the Soviet Army occupied the Polish city of Lwow. The city was declared to be the capital of the Western Ukraine and would shortly become a member of the Soviet Union. Polish street names and signboards were replaced by Ukrainian ones. After the military occupation the NKVD, Soviet Secret Police, arrived. Karolina Lanckoronska, a Professor of Art History in Lwow, at the Jan Kazimierz University, was invited to visit NKVD headquarters. There she was asked about what she had done before the war and asked to confirm that she was a Countess. The NKVD were arresting young men - they disappeared without trace. The rumour was that they had been taken away to Russia. On 11 February 1940 a peasant arrived at Karolina Lanckoronska's flat with the news that the Soviets had rounded up all the families from the neighbouring Polish villages. They had loaded them onto trains of cattle trucks. The next day more and more of these trains appeared in the sidings at Lwows' railway stations. They came from areas to the north and west of Lwow. Eventually they began to move east towards Russia. Karolina Lanckoronska was visited by Father Tadeusz Fedorowicz, Canon of the Roman Catholic chapter in Lwow, who came to say goodbye as he told her that he intended to sneak on board one of the trains. He succeeded. The round up of Poles took place all over eastern Poland between the 10 and 13 February. The Polish ZWZ (Union for Armed Struggle) estimated that over one million Poles had been deported to Siberia and Kazakhstan. In the spring of 1940 a Soviet and German commission made preparations to return to German occupied Poland those who had fled eastwards in September 1939. Karolina Lanckoronska obtained forged papers and on 3 May 1940 departed from Lwow. After a final search by the Soviets she crossed the bridge at Przemysl into German occupied Poland. On the morning of 8 May Karolina Lanckoronska arrived in Krakow. Four days later she was approached by a woman who told her that she knew she was a member of the ZWZ and that the Krakow ZWZ commander Tadeusz Komorowski wanted to see her. In January 1940 Karolina Lanckoronska had taken the military oath in Lwow and become a member of the ZWZ (Union for Armed Struggle). She abandoned her plans of going to Rome and applied to work for the Polish Red Cross. In the autumn of 1940 Polish prisoners-of-war began to return from Germany. A transport of 500 tuberculosis victims were placed in the Jesuit College in Copernicus Street. 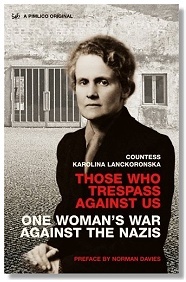 Karolina Lanckoronska helped take care of these sick and dying prisoners-of-war. On 22 June 1941 Nazi Germany invaded the Soviet Union. A few days later the Germans captured the city of Lwow. Karolina Lanckoronska then heard a rumour that the Germans had arrested a large number of Professors from Lwow University. Prisoners in the German occupied Poland were dying every day from starvation. Karolina Lanckoronska asked the President of the Main Council for Relief (RGO) to appoint her as an administrator and to extend the organisations' relief function to the prisoners. She resigned from the Red Cross as she was not allowed to belong to both organisations at the same time. Karolina Lanckoronska then approached the German authorities for permission to distribute food to people in prison. The Gestapo granted her permission to do so. In September 1941 she travelled to Lwow. She found out that in the summer of 1940 the Soviets had again deported train loads of Poles. Those deported were people who had fled from the Germans in 1939. In May 1942 Karolina Lanckoronska was arrested by the Gestapo and taken to Stanislawow. There she was interrogated by Hans Kruger who admitted to her that he was responsible for the murder of the arrested Professors from Lwow University. She was kept in prison in Stanislawow until July 1942 when she was transferred to Gestapo headquarters in Lwow. There she was questioned by Walter Kutschmann, Commissar of Police. He told her that the Italian royal family had intervened on her behalf with Heinrich Himmler, Chief of the Gestapo. Karolina Lanckoronska was told that she was to be treated as well as possible and would be given a private cell. On 26 November 1942 she was told that she was being taken to Berlin. She left Poland and entered the German Reich on 28 November. There she was questioned by Sturmbannfuhrer Hertl concerning Kruger's confession to her that he had murdered the Lwow professors. Herlt told her that Kruger would be put on trial but that her personal fate had yet to be decided. On 9 January 1943 she was removed from prison in Berlin and taken to Ravensbruck, a concentration camp for women. She was given the number 16076. A fellow Polish prisoner told her that Polish women (and only Polish women) were being shot at Ravensbruck for political activity and that Polish women were also being used as "rabbits" (guinea pigs) for medical research. In August 1944 they learned in the camp that the Uprising had begun in Warsaw. A stream of transports arrived at the camp bringing women prisioners from Warsaw. At first they all appeared to be from the Warsaw district of Wola but then they came from the Old Town, Mokotow, Zoliborz and Srodmiescie as the various districts of Warsaw fell to the Germans. In January 1945, a newcomer to the camp, the wife of the Mayor of Cologne, told Karolina Lanckoronska the terms of the Yalta agreement. Karolina Lanckoronska was now a person without a homeland. On 5 April 1945 she was released from Ravensbruck. Publisher - Published in the UK by Pimlico in 2005. Published in the USA in 2008 by Da Capo Press as Michelangelo in Ravensbruck: One Woman's War Against the Nazis. Karolina Lanckoronska was born on August 11 1898, the descendant of a Polish ambassador to the Holy See in 1355 whose descendants took on the name Lanckoronski from their lands in West Galica. When Poland was partitioned by her neighbours in the late 18th century, the family settled in Vienna, where successive generations occupied important positions in public life. Young Karolina was brought up in Vienna to speak French and English to her father and German to her Prussian mother; she learned her native tongue from a Polish governess. This page was added on 20 March 2010. Updated on 15 August 2012.